As the first day of the road trip featured Sør-Trøndelag, the Coastal Road, the Atlantic Road and Åndalsnes, you'd think we might take it easy on day two, right? After a light breakfast at the campsite, we threw everything in the Civic and drove the short distance to Trollstigen as soon as we could. The reasoning was simple. The earlier you arrive, the better your chances of beating the tourist buses that make driving the Troll's Path a chore not a thrill. 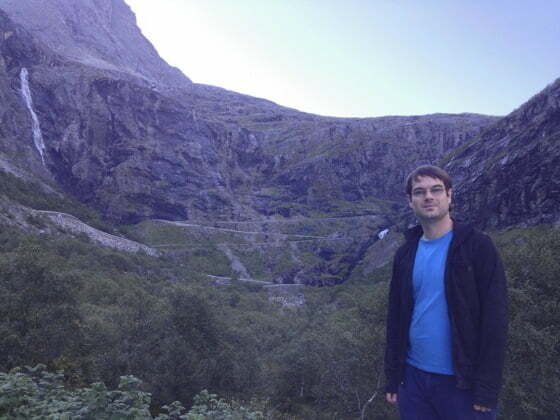 As you can see, we arrived at the base of Trollstigen with barely a car in sight! We wandered around the base of the mountain for about 20 minutes, taking photos and just trying to take in the sheer size of the wall of rock we were about to drive up. Because it was so quiet, I drove as slowly as possible to take in the views that had often eluded me on the trip up until this point. I pulled over at pretty much every opportunity to take photos of the road, mountain, and waterfall from all different angles. 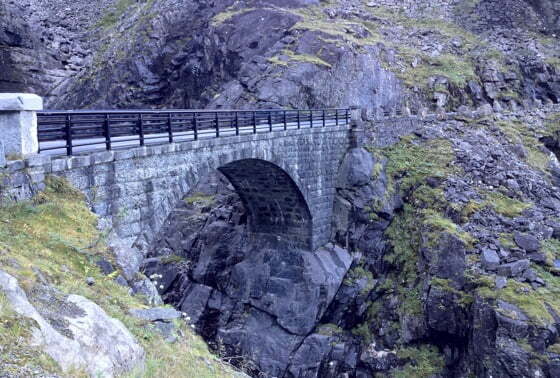 At around the half-way point there's a stone bridge crossing the Stigfossen waterfall. We pulled over and were met by a cyclist taking a break. A cyclist! 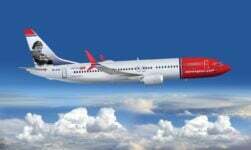 No doubt about it – he was surely Norwegian. The traffic slowly but surely began to increase, so it soon became clear the decision to arrive early had been a wise one. On the final few bends I had to pull over several times to allow bigger vehicles to pass – a really annoying distraction from the wonderful views enjoyed by Gerry and Chris. 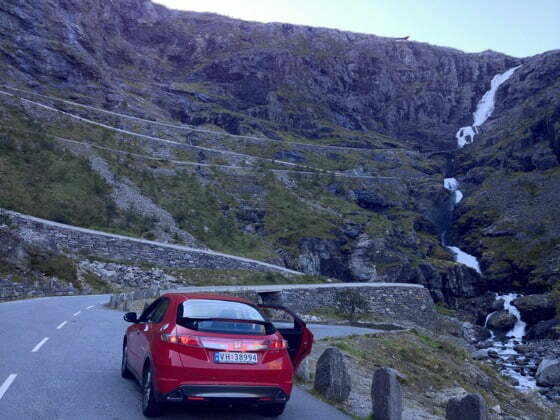 I'm told up to 2,500 cars tackle Trollstigen every day during high season. Make no mistake – come early or late, otherwise you'll regret it! 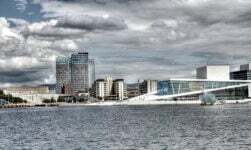 At the top there is a visitors centre that bares more than a passing resemblance to Oslo's Opera House, containing a canteen, shop, toilets, and several well-constructions pathways and viewpoints over the road and valley below. If you've had a frustrating drive up then the views from up here will more than make up for it. 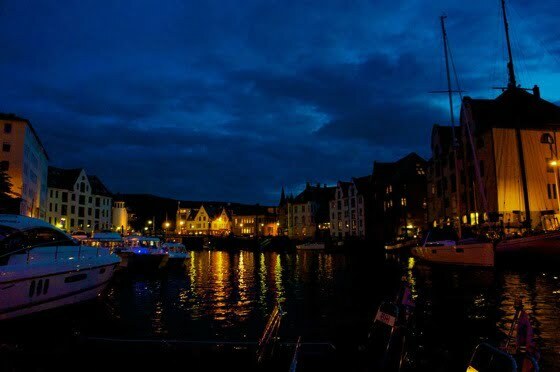 It's all thanks to the Norwegian Government's investment in National Tourist Routes. We found several of these improved facilities along the course of our road trip and made the most of all of them – they are a great investment. We adapted our plans for the day a little so we could stay and enjoy the area for a bit longer. The distances in this part of Norway are further than you think. If you're planning a road trip like this, you must factor in plenty of stops. If you find somewhere as beautiful as we did, your stops will last twice the time you intended! After about an hour we were back on the road for the 20 minute drive to the short Eidsdal-Linge ferry crossing. 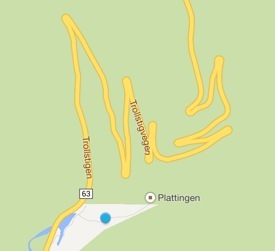 The stopping point is half-way down Ørnevegen, a rival to Trollstigen with its 11 hairpin bends. “Breathtaking” is an overused word in travel writing, but the Geirangerfjord demands its use. 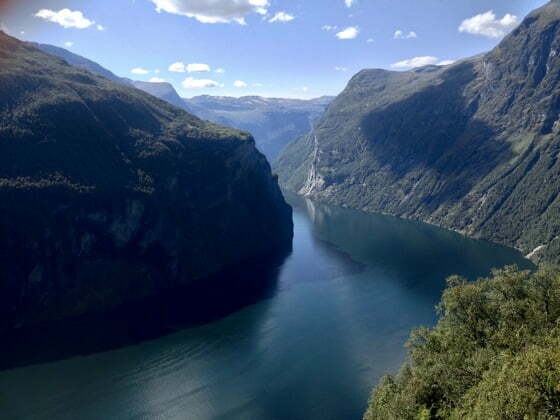 At up to 700m deep and lined by sheer cliffs up to 2000m tall, the fjord is the perfect demonstration of Visit Norway's new tagline, “Powered by Nature”. 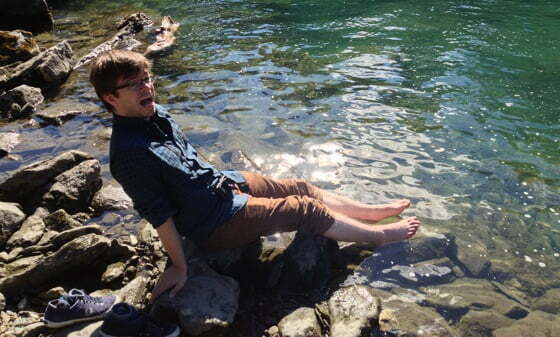 This fjord is surrounded by the steepest and, one is almost tempted to say, the most preposterous mountains on the entire west coast. 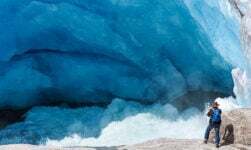 It is very narrow and has no habitable shore area, for the precipitous heights rise in sheer and rugged strata almost straight out of the water. 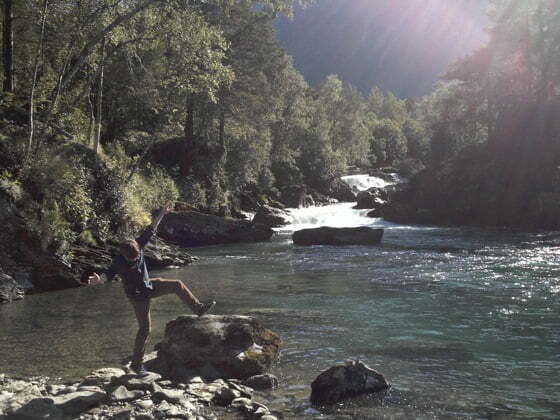 Foaming waterfalls plunge into the fjord from jagged peaks. We were in desperate need of food, so stopped in Geiranger for a late lunch. The little village doesn't offer much for road-trippers, so unless you're interested in overpriced food, the tourist ferry, or a plastic troll, I'd advise you drive to the other viewpoints in the area. As our digs for the night were 100km away in Ålesund, we gobbled down our lunch and got back on the road. We retraced our steps (tyre tracks?) 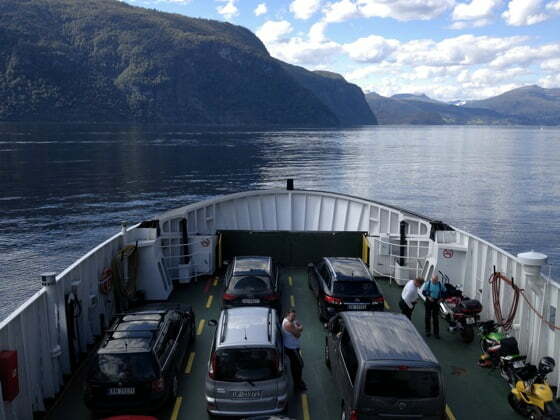 back to the Eidsdal-Linge ferry, but then turned north-west along the 650 to meet the main E39 road to Ålesund. 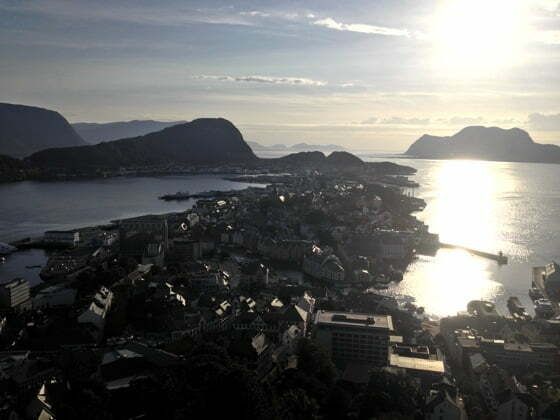 Having already been charmed by Ålesund earlier this year, I was thrilled to be heading back there so soon. We spent the night at the First Hotel Atlantica, who kindly added a third bed to our room and had set everything up for our arrival. Spending the night in a decent hotel proved to be a wise move – I slept like a log! After the obligatory climb up to the Aksla viewpoint, we met up with Twitter celebrity (!) and Ålesund local Elise. She took us on a short walking tour of the city and introduced us to the wonderful selection of beers at the Brosundet Bar. It was a gorgeous evening so we were able to enjoy our beers and conversations outside. Thanks Elise! Click here for day 3, the return to Trondheim via the Dovre mountains. Waiting for your continued journey. Shouldn’t Day 3 be posted by now. Lol. Am planning Avery similar trip and am enjoying your insights. 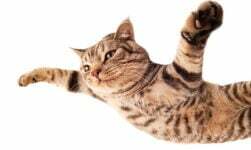 Thanks for this blog, i always love reading your blogs. 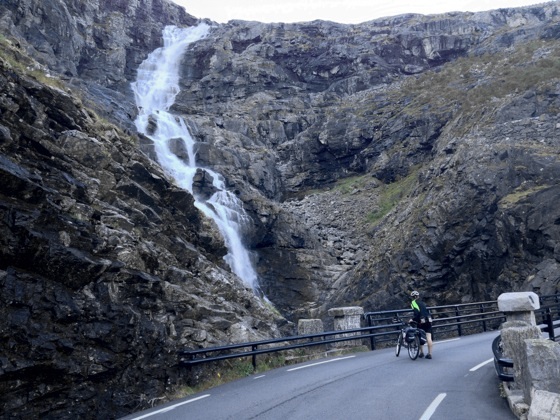 Me and my husband were planning to come to Norway in July/Aug and were planning to take the Geiranger – Trollstigen route. I was going through your Day 2 trip and saw that you started your day from Andalsnes and moved to the tip of Trollstigen. I was a bit confused and needed some guidance from you. 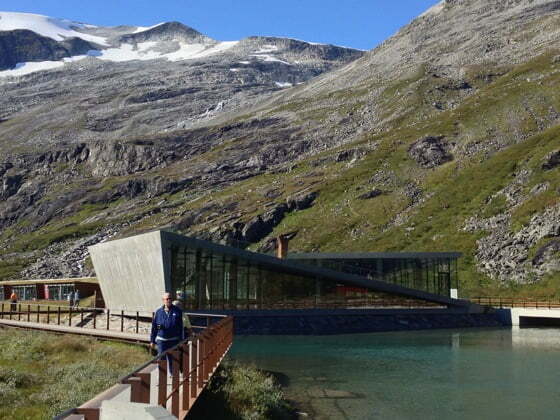 I saw that the geiranger-trollstigen route begins from Valldalen and moves up to the visiting centre. Does this mean that you travelled 2 hours till Valldalen in the morning and then travelled up to return back to Geiranger OR is their a route from top of trollstigen to geiranger which also has the same 11 hairpin bends. Your guidance will be really helpful for us to plan the trip better. Thanks in advance. Yes agreed everything lies on route 63, just that every blog about geiranger-trollstigen mentions that this extraordinary road trip starts from valldalen and yours was the only one which seemed to move in the opposite direction which we were also inclined to take? Is that equally enjoyable. Actually we havent yet decided our route, and i got confused while reading your blog as in your blog you mention that you begin from the base and then reach the lookout point…i am confused when one is coming from andalsnes do we directly reach the lookout point first and then climb down the 11 hairpin bends to valldalen, is my understanding correct? I just chose the other way because I live in Trondheim and approached the area from that direction. 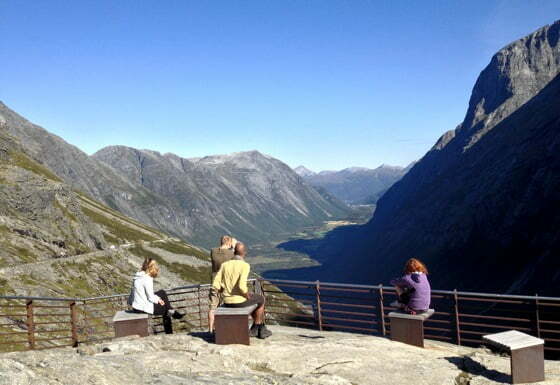 Most tourists start from Geiranger. Thanks David, actually i am a bit confused as everyone plans their trip from Valldalen to the top and you have taken the opposite direction, is that also equaly enjoyable with same views? 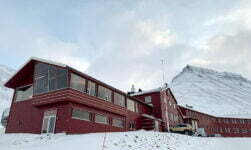 Also, you mentioned in your blog that you start at the base and climb to the lookout point – base would be near andalsnes and post lookpout point you would have covered the same road with 11 hairpin bends in the downward direction… is my understanding correct.. Apologies for bothering you again..want to be very sure as will make bookings accordingly. When you approach Trollstigen from the north (Åndalsnes) you arrive at the base and drive up the mountain turns to the lookouts. From here, it’s another couple of hours on to Geiranger. 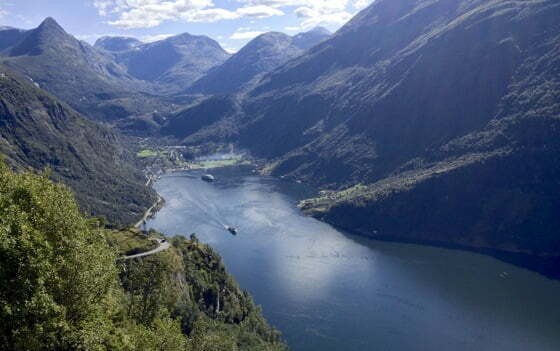 If you approach from the south (Geiranger) you need to allow a couple of hours for the ferry and the drive and you will eventually reach the lookout. 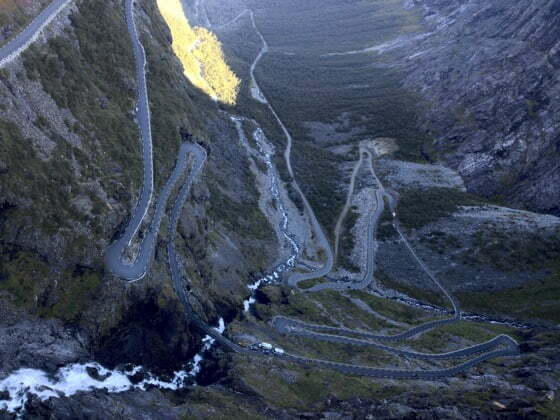 You can then drive down the turns of Trollstigen and onto Åndalsnes or wherever. All these attractions are part of road 63 so you can drive in either direction, it all depends on where you want to start and end your day. 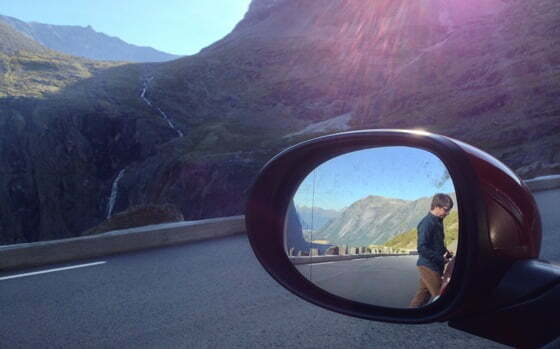 1st thanks for the tips about traffic in Trollstigen. When you mention I should do the drive early or late what time do you mean. Between which hours you see the buses? 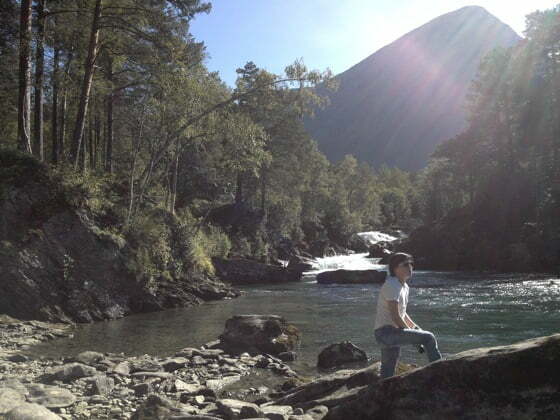 If you’re staying in Åndalsnes you’re very close, so anytime in the morning should be fine. Enjoy! May I know how is the price for renting car over there? There are so many variables, it’s best to get a quote based on your circumstances. 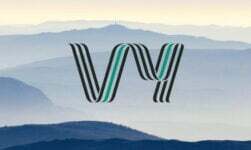 Most major companies such as Avis, Budget and Enterprise have rental offices here and quotes can be sourced online.